In this post we will see how to upgrade prime using its command line interface (CLI). You can use GUI as well, but it is much quicker if you could upload the patch/upgrade files onto local FTP server & then apply it onto prime. You can use “show version” CLI command to verify current prime version. We will use this to upgrde to PI 1.4.1 (patch PI_1.4_0_45_Update_1-39.tar.gz) to support new 3700 series AP. You can download these patches from the software section of PI in CCO page as shown below. You also need to check the release notes (Here is 1.4.1 release notes) to make sure your upgrade path is correct & its compatibility with other products. primedev/admin(config-Repository)# user admin password ? primedev/admin(config-Repository)# user admin password plain ? 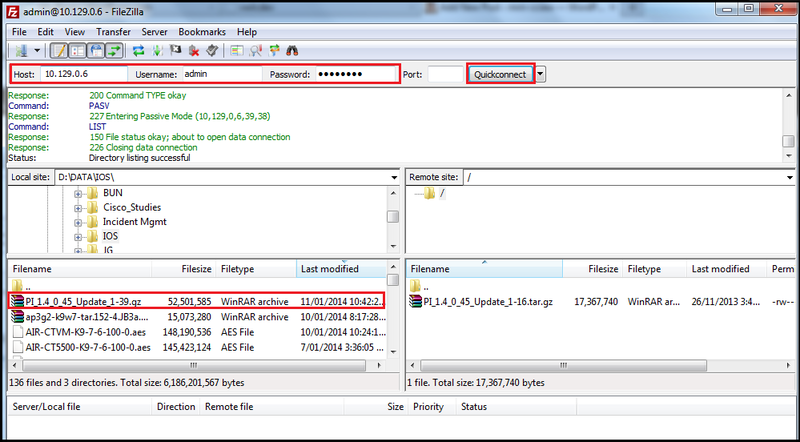 You can create username & password for FTP access using the below command. There is default FTP user called “ftp-user” also there if you like to use it. primedev/admin# ncs password ftpuser ? primedev/admin# ncs password ftpuser admin ? primedev/admin# ncs password ftpuser admin password ? Now using any FTP client you can connect to this FTP server to upload the patch file. I have used Filezila client which is freely available from here. You can use the “admin/Cisco123” user credential connect to prime FTP server as shown below. Then you can drag & drop the required patch file onto PI repository you created as shown below. Once copied you can verify using “show repository <Repository_Name>” command as shown below. Then you can install patch using the “patch install <filename> <repository_name>” CLI command as shown below. It may take few minutes (depend on the upgrade) & you should see the successful patch information message at the end. primedev/admin# patch install PI_1.4_0_45_Update_1-39.gz ? primedev/admin# application upgrade <PI_Upgrade_bundle> ? You can verify the version with “show version” or “show application version NCS” command. primedev/admin# show application version ? Here is some other useful CLI commands you can use with this product. Full list of PI v1.4.1 command reference you can find here. Excellent guide. Thanks for your hard work. Do you know if it’s possible to add a domain before or after the username. That version cannot be upgraded to 2.0. 1.4.x is a special train & not compatible with 1.3->2.0->2.1 etc. can i upgrade prime 2.2 to 3.0 directly?? PI-Upgrade-3.0.0.0.78.tar.gz.zip. do i need to backup or my data will be as it is?? Yes, you can do, but I do not recommend. If you come to see my blog in 1 week time, you will see why. Read this post & decide. i have question to you prime 2.2 related. can you help me to enable below for reporting and notification stuff.. in our network we have two types of switches one type for wireless and one type of wired. 5. Any Access point down. 6. Datacenter switches and core network devices – Any ‘up’ interface is down. Great Blog you maintian here, I just have a quick one, is there way on CIsco Prime to know which devices have SSH enabled and which one have Telnet Enabled like in a report or something. I get “software update” pop up after log on PI 2.2 GUI and planeed to update patch. Should i installed PI 2.2.3 maintanance release and after install Pi223_update_06-8.ubf ? Which patch should i have update first? 2. pi222 update_04-3.ubf-update 04 for PI 2.2.2 only. Refer release notes for accurate instructions. Regarding patches, if you install latest patches, I think that will cover earlier patches as well. I have attended Cisco live 2017(Melbourne ) and missed opportunity to meet you. I’m planning to install PRIME, Starting from scratch. Could you please provide me step by step installation guide would be appreciated. Will meet next time when you come to CLMEL. Regarding your query, pls find below URL which consist PI installation guides. Definitely we will meet on CLMEL 2018. Many Thanks for detail information. Hi Rasika, Is there a way to increase the memory size with Cisco Primes CLI? I am getting am error 131. Any suggestions? Thank you very much for the Writeup. Its very much appreciable when somebody wrote funtastic write up like this basically on Cisco Prime, Which is very much new to the market. I want to create a report in Prime 3.1 showing me what APs have SSH enabled. What steps do I need to do to produce this report?